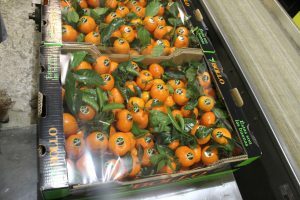 Editor’s note: The authors share what they learned while touring Spain’s citrus industry in March of 2017. Production is primarily focused on the fresh market, with much fruit exported to various EU countries as well as to North America. While Spain produces only about 6 percent of the world’s citrus, it accounts for nearly 25 percent of fresh citrus exports worldwide. Spain produces an excellent mix of fresh varieties from September to June. The main commercial varieties grown are oranges, which comprise about 62 percent of production. 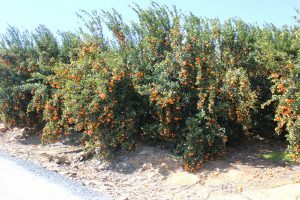 Oranges consist mainly of early (Navelina), mid-season (Lane Late, Navelate and Salustiana) and late (Valencia) varieties. Mandarins, including satsumas, clementines and various others, account for 22 percent of Spain’s citrus production. Lemons and limes represent 11 percent of production, and grapefruit and pomelo account for 5 percent. Nearly 75 percent of Spain’s total production is marketed as fresh, with about 25 percent being processed into juice as field run or as packinghouse eliminations. The Spanish have excellent production systems, state-of-the-art packinghouses, good transportation and access to the EU market. Citrus has historically played an important role in the Spanish culture, which is evident from the ornamental rows of bitter orange (similar to sour orange) trees growing along the streets of the cities we visited, or even within the buildings’ courtyards. Several cities boast over 40,000 citrus trees in the urban landscape. In some cases, the fruit from these trees is sold by the cities to organizations that make jellies and marmalades. Figure 1. 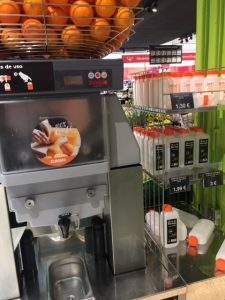 On-demand orange juice machines are found in Spanish supermarkets. In Spain, most oranges are consumed fresh. 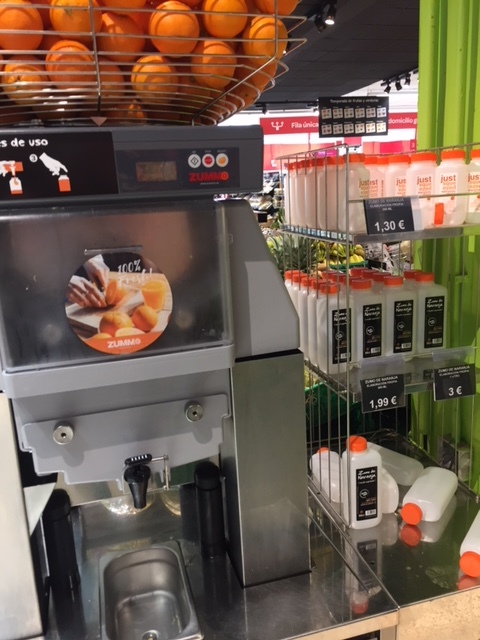 While we traveled around the country, it was interesting to see freshly squeezed juice made on demand by the glass in bars and restaurants, and by the bottle in supermarkets (Figure 1). Each establishment had a machine with oranges on top waiting to be squeezed at the push of a button. The consumer cannot get a fresher glass of juice. Spain’s citrus production takes place in four autonomous communities or regions: Andalusia, Catalonia, Murcia and Valencia. Catalonia, Murcia, and Valencia are located along the east coast of Spain. Catalonia is in the northeast and borders France. South of Catalonia is Valencia, and south of it is Murcia. Andalusia is in south central Spain. Andalusia and Valencia account for nearly 90 percent of the country’s citrus production. In Andalusia, citrus operations are significantly larger than in the other regions. Spain’s climate is very similar to California, with hot dry summers and relatively cold winters. Rainfall averages from 16 to 24 inches per year, with some locations receiving less than 10 inches per year. Therefore, irrigation is essential but can be costly. The rainy season is in the fall, with some rains occurring during the winter. The low-humidity climate allows for the production of excellent fresh fruit with few peel blemishes. In several areas we visited, irrigation water is supplied from surface sources. These sources require water to be transported many miles across locations. Water sales and delivery across autonomous regions creates numerous issues, both economically and politically. Water issues arise even within a region. Every Thursday, the so-called “Tribunal of Water” meets in a plaza of the city of Valencia to settle growers’ disputes over irrigation water. According to some, the origin of the tribunal dates back to Roman times. Availability of irrigation water is a historical issue in Spain. So it is not surprising growers put availability of water at the top of their list of problems. Several growers indicate that their annual cost for water can be as high as $3,000 per acre. Spain’s average citrus planting is rather small compared to Florida and Brazil, with many plantings being less than 7 acres. The planting size varies according to location. In the Valencia area, citrus is planted along hillsides and requires terraces. Terraces limit the use of machinery, thereby requiring more labor for production and harvesting, resulting in increased costs. Soil type and pH vary widely. Soil pH commonly ranges between 7 and 8. High pH and issues with salinity mandate the use of rootstocks that are capable of handling those soil characteristics. In many of the areas we visited that were not on terraces, the soil contains a significant percentage of clay. Clay-type soil requires groves to be planted on raised beds to enhance drainage when rains occur. Planting densities vary with variety and rootstock. Plant spacing ranges from as close as 6 feet in rows to 16 feet between rows, to a more common spacing of 10 feet in rows and 20 feet between rows. Figure 2. This block averages more than 600 boxes per acre. Yields per acre vary widely with variety, tree age, tree density and location. We saw many groves in which trees were yielding nearly 600 boxes per acre (Figure 2). These groves have very large trees with their canopies bending due to the weight of the fruit. All fruit harvested for the fresh market is individually clipped from the stem, leaving a small portion of the stem still attached to the fruit. Clipping contributes to improved fruit shelf life by eliminating some fruit decay diseases. For some markets, fruit is harvested with a short stem and a few leaves attached (Figure 3) to it. A telltale sign of freshness for consumers is the leaves remaining fully attached and spread open. Figure 3. Fruit is packed with stems and leaves remaining to indicate freshness. Selective harvesting may be conducted in several passes in the grove, where the highest quality fruit is harvested based upon size, color or other factors for the fresh market. In the final harvest, fruit is sent to the processing industry to be manufactured into various juice products. Since the requirement for the fruit sold as fresh is to be clipped (not handpicked like in Florida), lots of hand labor is needed. To clip each fruit individually from the tree takes more time and reduces the amount of fruit that can be harvested per hour. Due to clipping, the picking cost can easily exceed $3 to $4 per box. These costs do not include the regulatory costs or the cost for hauling the fruit to the packinghouse. Figure 4. Open pruning in the center of the tree allows more light to penetrate the internal canopy. Additionally, many of the groves are completely pruned by hand, without the use of any hedging or topping machines. The trees are usually topped to a height of about 8 feet. Then, additional internal pruning is conducted to open the center of the tree to allow light to penetrate the canopy to enhance fruit color development (Figure 4). One grower we spoke to indicated that, on average, a worker can manually prune approximately 60 trees per day. The cost to prune each tree is approximately $2 to $3 per tree per year. In relation to labor supply, workers can easily move within EU countries. Many of the citrus-production workers migrate from eastern European countries. In recent years, due to Spain’s high unemployment rate, labor supply has been less of an issue. However, the hourly labor cost is as high as or higher than in Florida. The hourly rate for basic unskilled labor can range from $10 to $12.50 per hour, plus regulatory costs required by the government. Skilled labor hourly rates are even higher. We noticed groves that were only 10 to 15 years old that had already been top worked to newer varieties several times. The rationale for it is to meet changing consumer demands or to try to capture new markets with newer cultivars. In some cases, growers are planting varieties that are patented, so they have to pay a royalty to obtain the right to plant such variety. One grower suggested that his fee to plant a specific variety approached $3,000 per acre. When issuing the licenses, the patent holder typically stipulates a limit on the number of acres that can be devoted to the variety, effectively limiting supply. Therefore, growers expect to receive high enough prices for such fruit to justify their investment. 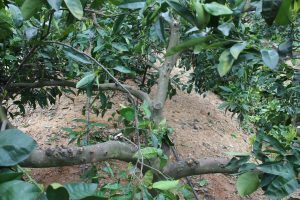 In the areas where many groves are rather small in size, growers are exiting the citrus business and looking for alternative crops due to high production costs and small returns. Just like in Florida and many other regions in the world, consolidation is occurring. Larger farms are expanding operations or vertically integrating to control a large part of their production system, from growing to marketing fruit. Some of the growers who were looking for land to expand their operations also mentioned that while land may be available, it usually is not in large tracts. In addition, the other key issue they have to consider is whether the land has adequate water supply available to irrigate citrus acreage. Major expansion in acreage is unlikely with current prices and production costs. Citrus production in Spain has a number of disadvantages. These include limited rainfall, lack of different varieties available to fully supply the fresh market over the production season, and the small size of groves that limit mechanization and require more labor. All of these factors lead to higher production costs compared to other citrus-producing countries. On the other hand, Spanish growers have a great climate to grow fresh fruit, access to the large EU market, and few serious diseases. 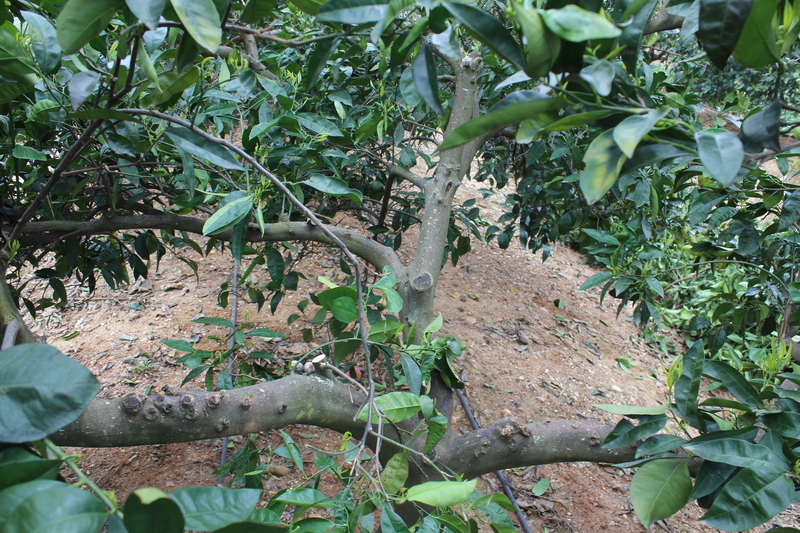 HLB has been detected in neighboring Portugal and is expected to eventually enter Spain. Even though Spanish growers are wary, they are optimistic about managing the disease. All in all, Spain’s citrus production is outstanding with lots of varieties to meet market demands, excellent growing conditions to produce nearly blemish-free fruit, modern packinghouses and market accessibility to the EU. Stephen H. Futch is a multi-county Extension agent, and Ariel Singerman is an assistant professor. Both are at the University of Florida Institute of Food and Agricultural Sciences Citrus Research and Education Center in Lake Alfred.